You fight the weight gain and drop the size. You are depressed with pain attacks and period guessing torture. You eat again and gain weight. You get stuck in a vicious weight circle. Your hair falls off. You have pimples all over the face. You have belly fat and embarrassing body hair …Always scared whether you can get pregnant or not. PCOS play with your beautiful life and shatter your dreams. PCOS mess with every aspect of woman’s life. You struggle for answers. Your doctors don’t explain things well enough. They just tell that you have high levels of male hormones. You are left with no choice but to endure mental agony.That is how PCOS mess with every aspect of woman’s life. Picture for a moment what it would be like if you get rid of PCOS completely. Imagine how you’d feel if you’ll no longer worried about your looks, femininity and motherhood. It isn’t just a fantasy. It can happen to you. So keep reading this article till the end and it is going to change your life. How to permanently cure PCOS ( Change your beliefs and make right choices and so that dreadful PCOS will run away from your life). The way the mainstream doctors treat PCOS reminds me the story of the blind men and the elephant. Like the blind men, doctors can never see the full picture and therefore they can never cure the PCOS. At the most PCOS treatment mask the symptoms for some time. But you never regain your health.You keep losing your hope. With time you need more medicines and surgical procedures as complications emerge. In other words, your current treatment worsens your condition as time passes. A paradigm shift is needed in understanding the problem of PCOS and its treatment. Then only you make right choices so that you can end everlasting shame, agony and the dangers associated with PCOS. I have been blogging and writing hundreds of articles on infertility related topics. I could clearly see a pattern followed by PCOS sufferers. One of the biggest trap they fall in is believing whatever the doctor says. You only treat the PCOS to reduce the effects of symptoms like weight gain, unwanted hair and acne… because you believe that there is no cure for PCOS. Doctors treat the PCOS with birth control pills or hormonal supplements to mask the symptoms of PCOS because they believe that there is no cure for PCOS. You and your Doctor trying to mask the symptoms ignoring the root cause of PCOS. Months and years passed and the problem worsens. Neglecting the root cause of PCOS leads to irreversible damage to your reproductive system.Then you will be left with the only choice of IVF. You’re also risking a host of other chronic diseases. PCOS is a dietary and lifestyle disease. It affects your metabolism and hormonal systems. This results in many health consequences. Dietary and lifestyle disease can be treated only with changing diets and lifestyle. You can’t cure a dietary and lifestyle disease with the pills and surgeries. If you only rely on conventional medicine without changing your diets and lifestyle you are heading for life-threatening diseases. You already know or suffering the following PCOS symptoms. But in this article, I am revealing 7 other dangers associated with PCOS. I’m also discussing what dietary and lifestyle changes are required. You must embrace these dietary and lifestyle changes in order to get rid of PCOS completely and prevent these life-threatening diseases. Individuals with Polycystic Ovarian Syndrome (PCOS) are at increased risk of high levels of LDL “bad” cholesterol, which, if neglected, can have an adverse impact on cardiovascular health. Conversely, women with PCOS often also have lower levels of HDL “good” cholesterol, which is another risk factor to cardiovascular health. As a general rule, the lower the LDL level and the greater the HDL level, the more chance there is of maintaining good cardiovascular health. Insulin resistance associated with PCOS often leads to beta-cell exhaustion of the pancreas and ultimately to diabetes. Young women suffering from Polycystic Ovary Syndrome (PCOS) are at five times higher risk of developing type 2 diabetes, a new study finds. Stop processed foods, all forms of sugar—particularly fructose—as well as all grains, for whole, fresh food. PCOS women have 2.5 fold greater risk of having endometrial cancer. The risk of cancer of the endometrium, the inside lining of the uterus, is three times as high for women with PCOS as it is for other women.Irregular periods, or a lack of periods, can cause the endometrium to build up and become thick. 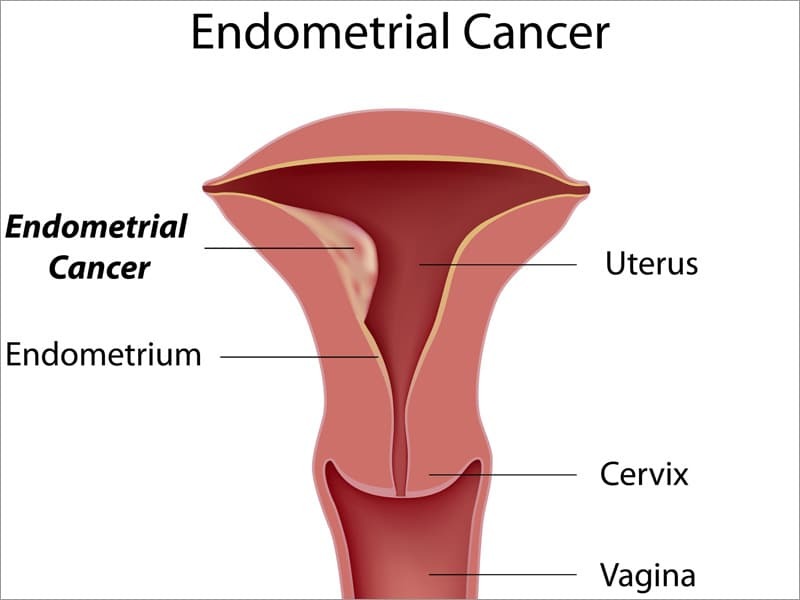 This thickening can lead to endometrial cancer. Cancers don’t develop overnight. A prolonged negativity in the life eventually manifests in the form of cancer. So intense and pervasive negative emotions are the root cause of cancer. Apart from healthy dietary choices, resolving all the inner conflicts are the key to significantly reduce the risk of cancer. Women with PCOS have reproductive abnormalities, including increased Ovarian Cyst-induced hypertension, and preeclampsia. This condition develops in late Ovarian Cyst and is characterized by the excessive gain in weight, albuminuria, migraines, visual impairments and generalized edema. Stop exposing yourself to xenohormones and to start taking a supplement called DIM (diindolylmethane). Hormones regulate important aspects of women’s sexual life including menstrual cycles. PCOS eventually affects ovulation and causes infertility in women. All these conditions are the sign of underlying cellular damage and inflammation due to wrong dietary and lifestyles. Conventional PCOS treatment is intended to correct hormonal imbalance but cannot stop the damage that is happening at the cellular level. neglecting this damage can potentially damage reproductive system. Delete the wrong belief of “The cause of PCOS is unknown and there is no cure for PCOS” from your mind permanently. Blindly following a mainstream doctor’s advice alone cost you a fortune… In fact, your problems get worse. You are risking your life. Stop hating your PCOS symptoms. Carefully listen and appreciate them. They are simply telling you that something is wrong is happening in your body that need your immediate attention. Pay attention to what you eat… what you think and how you live your life. Finally change your diet, mind and lifestyle completely. And finally, embrace this fact “PCOS is dietary and lifestyle created disease and you can cure PCOS with dietary and lifestyle changes only. Nothing wrong masking the symptoms with pills for some time.But the whole point is you have to eliminate the root cause with dietary and lifestyle changes. The core intention of this article is to make you change your wrong beliefs about PCOS treatment and give you a hope of complete recovery from PCOS. Indeed, you started out thinking that PCOS is not curable, I hope by now that you’ve come to realize that PCOS can be completely reversed. Go ahead and try these tips explained in this article. You will experience wonderful changes in your life provided if make these new choices as a way of your life.